What do you notice about the decimal forms of rational numbers compared to irrational numbers? rational or irrational? Explain your answer. Every rational number can be written as a fraction, that is, as a ratio of two integers. 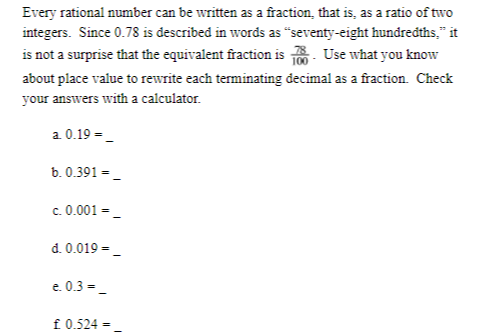 Since 0.78 is described in words as “seventy-eight hundredths,” it is not a surprise that the equivalent fraction is 78/100. Use what you know about place value to rewrite each terminating decimal as a fraction. Check your answers with a calculator. Jessica knows that .57575757 is a rational number, so she should be able to write it as a fraction. She wonders how to rewrite it, though. She started to rewrite it as 57/100 but she is not sure if that correct. Is 57/100 equal to .57575757? Explain your answer. What patterns do you see between the fractions and their equivalent decimals? What connections do these fractions have with those you found in problem 3? Be ready to share your observations. Use your pattern to predict the fraction equivalent for 0.242424... Then test your guess with a calculator. Use your pattern to predict the decimal equivalent for 65/99. Check your answer with your calculator.